Buffalo chicken is my new favorite obsession. I feel like I’m a little behind on the buffalo chicken trend, but that’s because I can’t handle spicy foods! Don’t get me wrong I love spicy foods, but my face gets red and I end up chugging a gallon of water. So feel free to add more or less buffalo sauce to these delicious buffalo chicken sliders! Disclosure: This post may contain affiliate links, which means I may receive a commission if you click a link and purchase something. I had a 50% off coupon for a pack of slider buns at Lidl’s and thought this would be a great time to experiment with buffalo chicken. Slider sandwiches are super easy to make and we end up having enough leftovers for lunch during the week. Check out my Pesto Chicken Sliders if you’re interested in non-spicy slider sandwiches! I’ve made my Easy Slow Cooker Shredded Chicken, adding only buffalo sauce before. I made quesadillas and they were delicious! However, they were too spicy for me so I drowned them in Ranch dressing. I didn’t want to make the same mistake with these buffalo chicken sliders. In the recipe below, I added 4 oz. 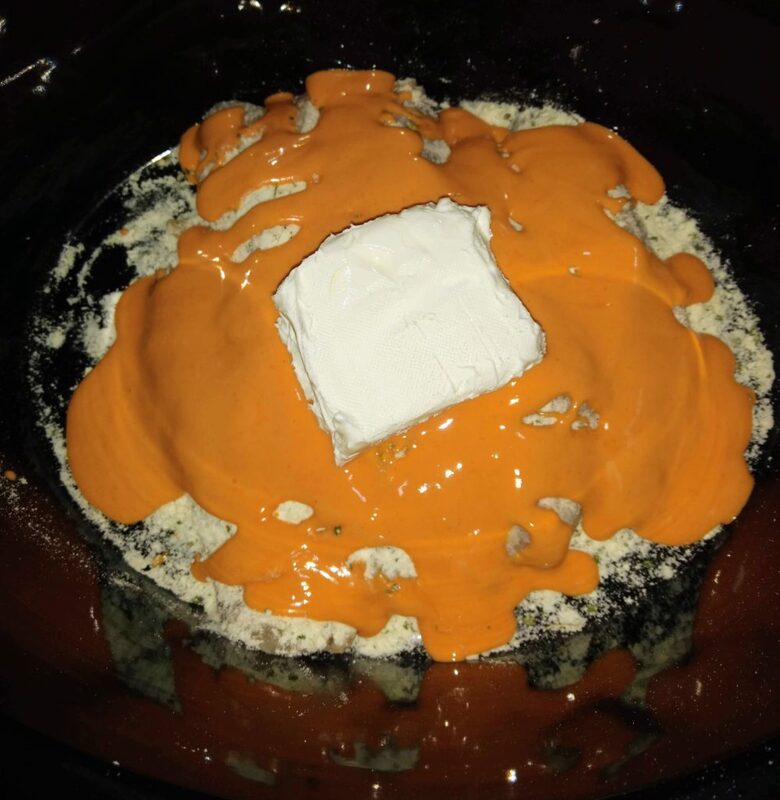 or 1/2 a block of cream cheese and only a cup and a half of buffalo sauce. This was perfect for me! You can always mess around with the cream cheese to buffalo sauce ratio, for more or less spiciness. Before cooking, it seems like there’s way too much buffalo sauce in there. But if you’re like me, don’t worry! Once you mix the cream cheese in, it’s the perfect amount. Make Slow Cooker Shredded Chicken with added ingredients and shred. 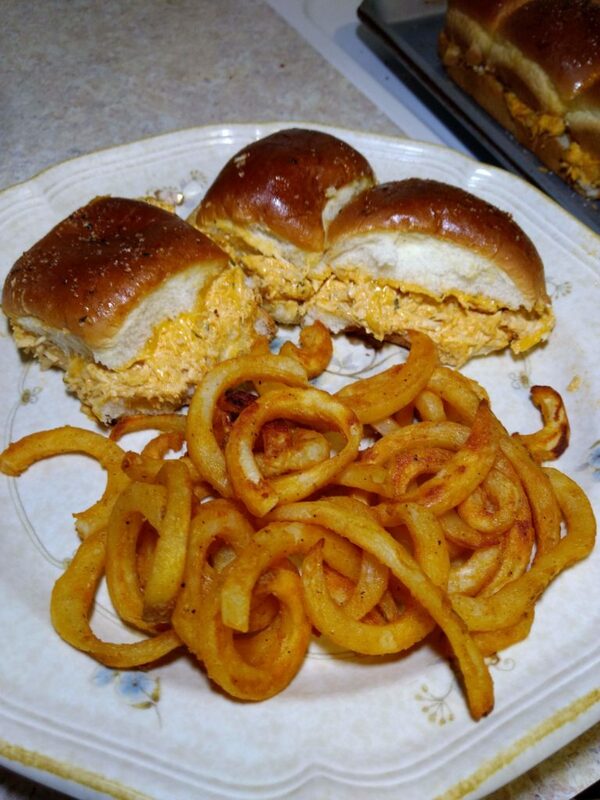 Cut slider buns (or get presliced) and spread buffalo shredded chicken mixture onto bottom buns. Spread shredded cheese on top of chicken and put on top buns. Spread margarine on top of buns (the side facing up!) and sprinkle garlic salt (optional). Broil on low for 10 minutes. Break apart sliders and enjoy! Slicing the buns can get very messy, I recommend getting presliced buns. You can add more cream cheese and less buffalo sauce if you want it less spicy. You can also melt the margarine (or butter) before spreading it on top. I just like the lazy approach. 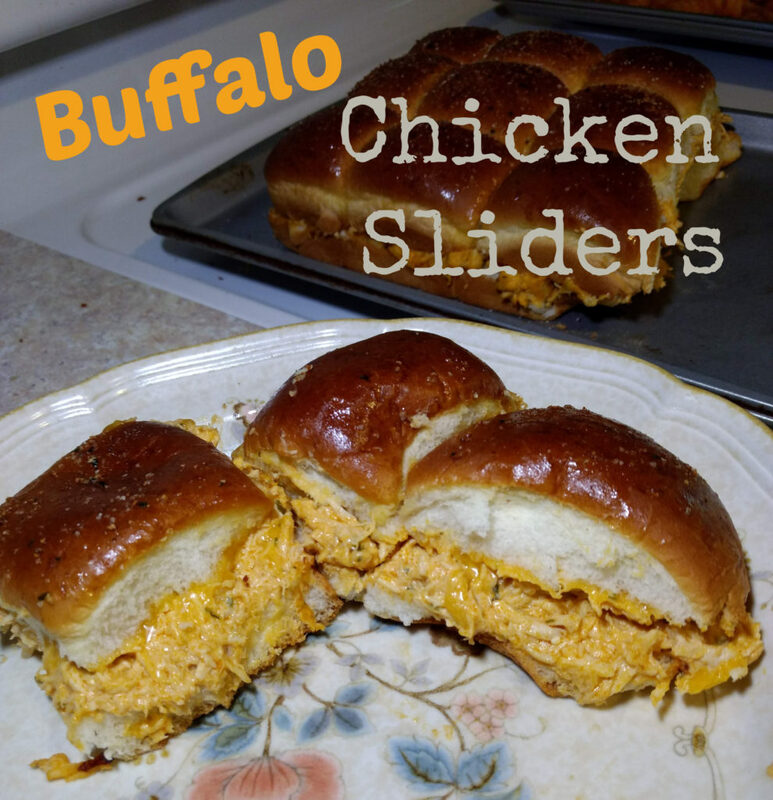 Have you made buffalo chicken sliders before? How spicy do you like your foods? Do you have a new food obsession? Let me know in the comments! 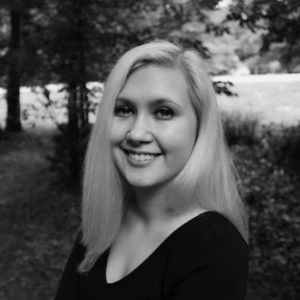 My name is Merrideth and these are my adventures in cooking and crafting.